Reiki in Health related problems. At hospitals and clinics across America, Reiki is beginning to gain acceptance as a meaningful and cost-effective way to improve patient care. Personal interviews conducted with medical professionals corroborate this view. The International Center for Reiki Training surveyed “America’s Best Hospitals,” as ranked by U.S. News and World Report, to discover that 60% of them currently had a hospital-based Reiki program in place. Of those that did not, 50% reported that they would consider it. Reiki is already used in several hospitals for cancer patients: Dartmouth Hitchcock Medical Center (Lebanon, NH), Integrative Medicine Outpatient Center at Memorial Sloan Kettering Cancer Center (New York, NY), Integrative Therapies Program for Children with Cancer at New York Presbyterian Medical Hospital (New York, NY), Metropolitan South Health Center (“ Direccion de Servicios Metropolitano Sur”, Santiago, Chile) Miles, P. True, G. “Reiki: A Biofield Therapy—Theory, History, Practice and Research.” Alternate Therapy Health Medicine, March/April 2003 9(2) 62-72. Used in conjunction with conventional cancer treatments, Reiki is reported to ease the side effects of chemotherapy and radiation, improve immune function, ease anxiety and enhance positive emotional attitude, decrease pain and promote relaxation. Department of Psychology, University of Calgary, Alberta, Canada.Tsang KL, Carlson LE, Olson K.
(2) in the rest condition, participants rested for approximately 1 hour each day for 5 consecutive days, followed by a 1-week washout monitoring period of no scheduled resting and an additional week of no treatments. In both conditions, participants completed questionnaires investigating cancer-related fatigue (Functional Assessment of Cancer Therapy Fatigue subscale [FACT-F]) and overall quality of life (Functional Assessment of Cancer Therapy, General Version [FACT-G]) before and after all Reiki or resting sessions. They also completed a visual analog scale (Edmonton Symptom Assessment System [ESAS]) assessing daily tiredness, pain, and anxiety before and after each session of Reiki or rest. Sixteen patients (13 women) participated in the trial: 8 were randomized to each order of conditions (Reiki then rest; rest then Reiki). They were screened for fatigue on the ESAS tiredness item, and those scoring greater than 3 on the 0 to 10 scale were eligible for the study. They were diagnosed with a variety of cancers, most commonly colorectal (62.5%) cancer, and had a median age of 59 years. Fatigue on the FACT-F decreased within the Reiki condition (P=.05) over the course of all 7 treatments. In addition, participants in the Reiki condition experienced significant improvements in quality of life (FACT-G) compared to those in the resting condition (P <.05). On daily assessments (ESAS) in the Reiki condition, presession 1 versus postsession 5 scores indicated significant decreases in tiredness (P <.001), pain (P <.005), and anxiety (P<.01), which were not seen in the resting condition. Future research should further investigate the impact of Reiki using more highly controlled designs that include a sham Reiki condition and larger sample sizes. Lind J. Dressen and Sangeeta Singh reported on the results of clinical tests done to determine the effects of Reiki on pain relief and other symptoms. The test was geared towards determining the effects of Reiki treatment on pain, anxiety and depression in chronically ill patients. The test procedures and results were published in the Journal of Subtle Energies and Energy Medicine in 1998. Patients who had been in pain for at least a year were the subjects of this test. The participants also suffered from headaches, heart disease, cancer, arthritis, peptic ulcer, asthma, hypertension and HIV. The participants were divided into four groups consisting of 20 people per group. One group received Reiki treatments, another group was guided through Progressive Muscle Relaxation, one group received no treatments and the fourth group received sham or “false Reiki” treatments. Each of the three groups received ten 30-minute treatments twice a week over a period of five weeks. Patients’ marker levels were measured before and after the series of treatments, but the group that received Reiki treatments was also examined three months after the completion of the tests. Dressen and Singh reported that “Reiki proved significantly superior (p<.0001-.04) to other treatments on ten out of 12 variables. At the three-month check-up these changes were consistent and there were highly significant reductions in Total Pain Rating Index (p<.0006) and in sensory (s<.0003) and Affective (p<.02) Qualities of Pain.” The study concluded that there were significant effects of Reiki on anxiety, pain and depression. Reiki is a non-invasive energy healing modality that is slowly but surely making inroads in the medical community. The beauty of Reiki is that it can be easily learned by anyone, regardless of age and physical condition. Although additional training is needed before one can become a Reiki therapist, anyone can learn Reiki and use it for her/his own physical, emotional, mental and spiritual well-being. But the studies continue (see NIH-supported clinical trials, which are currently recruiting patients to test the efficacy of Reiki, including distant Reiki). Autonomic Nervous-System-Changes During Reiki Treatment: A Preliminary Study. The Journal of Alternative and Complementary Medicine Volume 10, Number 6. This study revealed a significant reduction in diastolic blood pressure and heart rate in the Reiki group that didn’t appear in the placebo group or the control group, thus tending to indicate that Reiki created an important effect that was not caused by suggestion. Both hands-on and distant Reiki treatments resulted in statistically-significant decrease in the symptoms of psychological depression and self-perceived stress, and the treatments had the long-term effect [Shore, A.G., "Long-term effects of energetic healing on symptoms of psychological depression and selfperceived stress", Alternative Therapies in Health and Medicine]. The nature of psychological effects arising during a Reiki session were studied, and anxiety was shown to reduce after treatments [Wardell, D.W., Engebretson, J., "Biological correlates of Reiki touch healing", J. Advanced Nursing]. Certain physiological changes were associated with receiving Reiki treatments, including decrease in systolic blood pressure, increase in salivary IgA levels and decrease in salivary cortisol after treatments, increase in skin temperature and decrease in electromyographic activity during treatments [Engebretson, J., Wardell, D.W., "Experience of a Reiki session", Alternative Therapies in Health and Medicine]. Both hands-on and distant Reiki treatments resulted in statistically-significant decrease in the symptoms of psychological depression and self-perceived stress, and the treatments had the long-term effect [Shore]. The nature of psychological effects arising during a Reiki session were studied, and anxiety was shown to reduce after treatments [Engebretson, Wardell]. Certain physiological changes were associated with receiving Reiki treat-ments, including decrease in systolic blood pressure, increase in salivary IgA levels and decrease in salivary cortisol after treatments, increase in skin temperature and decrease in electromyographic activity during treatments [Wardell]. Five patients with life-threatening diseases participated in this study. The participants were suffering from lupus, fibromyalgia, goiter and multiple sclerosis. As part of the study, each of the five participants received eleven one-hour Reiki treatments from four different level 2 Reiki practitioners and one Reiki Master. The five Reiki therapists were asked to give Reiki over the same body positions which included neurovascular regions on the cranium, neurolymphatic points on the trunk and minor chakra points on the limbs. The participants received no other alternative treatments during the test period. Three consecutive treatments were initially given, and then the participants received one treatment once a week for eight weeks. The participants were tested before the study, after the third Reiki treatment and after the tenth treatment. Three acupuncture points on the hands of each of the participants were measured for skin electrical resistance. Significantly, after only three sessions, the spleen measurements went from 7.8 percent below normal to normal. The report states that “at the cervical/thoracic point, the measurements went from 25 percent below normal to the normal range.” Adrenal measurements, which were 8.3 percent below normal before the treatments began moved up to the normal range. Hartwell and Brewitt also said that all the participants reported increased relaxation after the Reiki treatments as well as reduction in pain levels and increased mobility. Explanation on how emotions affect our physical body. 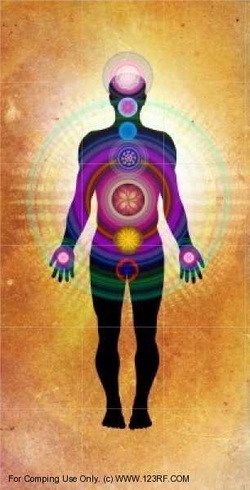 Each area of the body transmits energy on a specific, detailed frequency, and when we are healthy, all are "in tune." ...This way of interpreting the body's energy is sometimes called "vibrational medicine." It resembles the most ancient medical practices and beliefs, from Chinese medicine to indigenous shamanic practices to virtually every folk or alternative therapy.